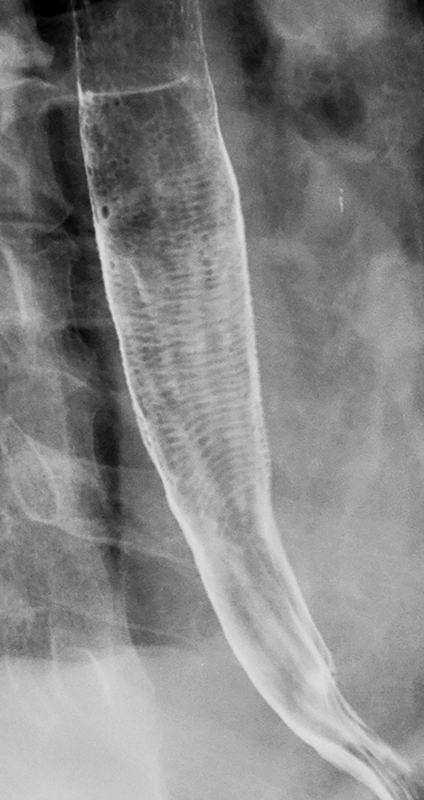 Double-contrast esophagography is performed as a biphasic examination that includes both double- and single-contrast views of the esophagus.1 After ingesting an effervescent agent, the patient continuously swallows high-density barium in the upright, left posterior oblique position for double-contrast views of the esophagus. A double-contrast view of the gastric cardia is also obtained in a recumbent, right side down position. 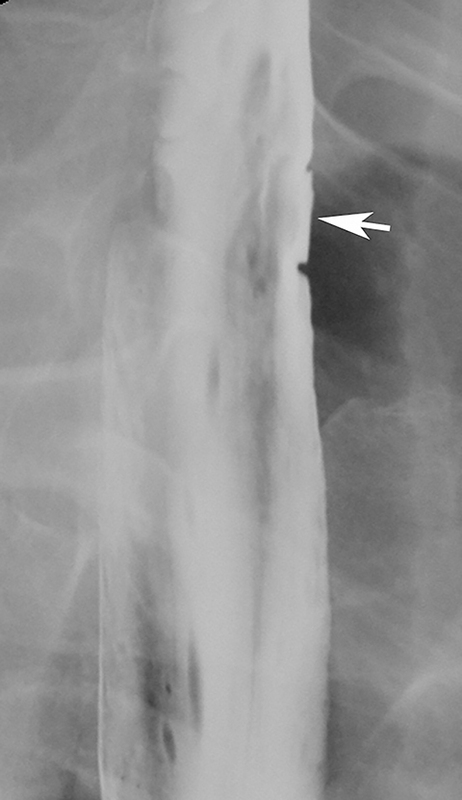 The patient is then placed in a prone, right anterior oblique position and asked to take discrete swallows of low-density barium to evaluate esophageal motility. Finally, the patient continuously swallows low-density barium in the prone position to optimally distend the esophagus. The double-contrast phase of the study optimizes detection of mucosal disease, while the single-contrast phase optimizes detection of narrowing due to strictures or rings in the esophagus. Candida esophagitis is usually manifested on double-contrast studies by multiple discrete, plaquelike defects separated by normal intervening mucosa (Figure 2A).4,5 The plaques tend to involve the upper and/or midesophagus and have a linear or irregular configuration.4,5 Patients with AIDS may develop a more fulminant form of candidiasis, with trapping of barium between innumerable plaques and pseudomembranes, producing a so-called shaggy esophagus (Figure 2B).5 This finding, which is virtually diagnostic of advanced Candida esophagitis, is not often seen in modern medical practice because of more effective therapy for HIV-positive patients. Glycogenic acanthosis is a common degenerative condition characterized by accumulation of cytoplasmic glycogen in the squamous epithelium of the esophagus. This condition is manifested on double-contrast studies by small, rounded nodules and plaques, most often in the midesophagus (Figure 3).7 Glycogenic acanthosis may closely resemble Candida esophagitis, but the plaques of candidiasis tend to have a linear or irregular appearance, whereas the nodules of glycogenic acanthosis are more rounded. Furthermore, Candida esophagitis occurs in immunocompromised patients with odynophagia, whereas glycogenic acanthosis develops in elderly patients who are not immunocompromised and have no esophageal symptoms. Thus, it is almost always possible to differentiate these conditions on the basis of the clinical findings. Superficial spreading carcinoma (SSC) is an unusual form of esophageal cancer in which tumor is confined to the mucosa or submucosa, regardless of the presence or absence of lymph node metastases.8 SSC is typically manifested on double-contrast studies by a cluster of poorly defined nodules or plaques that merge with one another, producing a confluent area of disease.1,8,9 SSC can usually be differentiated from Candida esophagitis and glycogenic acanthosis, in which the plaques and nodules have discrete borders and are separated by normal intervening mucosa. When SSC is suspected on the basis of the radiographic findings, endoscopy and biopsy should be performed for a definitive diagnosis, so these patients can be treated before they develop more advanced disease. The herpes simplex virus type 1 is the second most common cause of infectious esophagitis in immunocompromised patients.5 This condition is usually manifested on double-contrast studies by multiple small ulcers in the upper or midesophagus, often surrounded by radiolucent mounds of edema (Figure 5).11,12 Most patients present with odynophagia, but herpetic lesions are not commonly found in the oropharynx, so it is difficult to differentiate herpes from Candida esophagitis on the basis of the clinical findings. Patients on oral medications, particularly antibiotics such as tetracycline and doxycycline and non-steroidal anti-inflammatory drugs (NSAIDs), may develop a focal contact esophagitis. These individuals typically present with acute odynophagia and have a history of ingesting the offending medication with little or no water immediately before going to bed. As a result, the capsules or tablets may lodge in the midesophagus, where it is compressed by the aortic arch or left main bronchus. 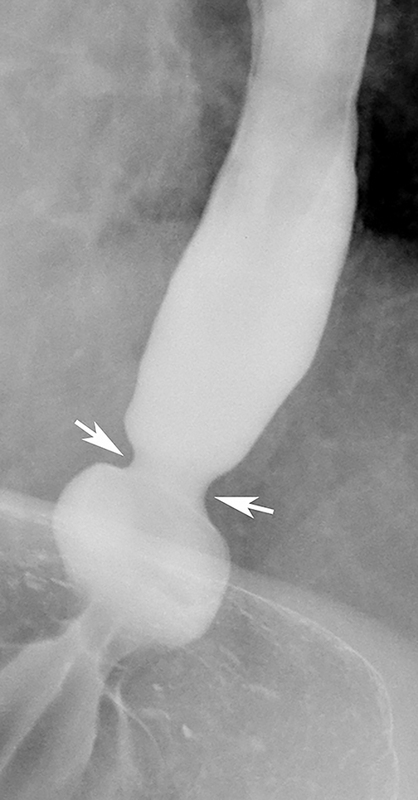 Double-contrast studies usually reveal multiple small ulcers in the midesophagus (Figure 6).1,14 This condition may be difficult to differentiate from herpes esophagitis on barium studies, but the clinical history usually suggests the correct diagnosis. Crohn’s disease involving the esophagus is occasionally manifested by small, superficial ulcers indistinguishable from aphthoid ulcers in the small bowel or colon in patients with this disease.15,16 Because esophageal Crohn’s disease is almost always associated with ileocolic disease, this diagnosis should only be considered in patients with known Crohn’s disease elsewhere in the GI tract. 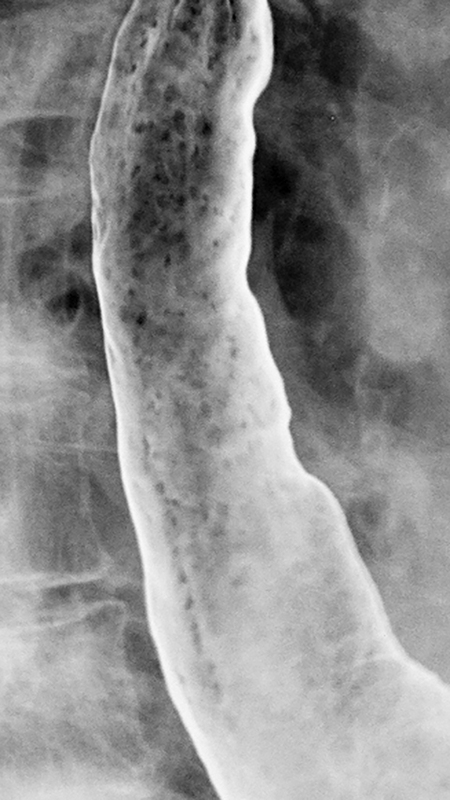 Patients with HIV may develop one or more giant esophageal ulcers that are caused directly by the HIV virus itself, as confirmed on electron microscopy of biopsy specimens showing viral particles with morphologic features of HIV.20 These ulcers are usually located in the lower or midesophagus, appearing on barium studies as giant (greater than 1 cm), ovoid or diamond-shaped craters surrounded by a thin, radiolucent rim of edema (Figure 7).21,22 These ulcers are indistinguishable from giant CMV ulcers in the esophagus, but most HIV ulcers heal rapidly on treatment with steroids,21,22 whereas CMV ulcers require treatment with antiviral agents. Endoscopy and biopsy are therefore required to differentiate these infections before instituting therapy. Unlike tetracycline- or doxycycline-induced esophagitis, which is manifested by small, shallow ulcers, esophagitis caused by potassium chloride, quinidine, NSAIDs, and alendronate sometimes leads to the development of giant esophageal ulcers.23-25 The correct diagnosis is usually suggested by the clinical history. >Ectopic gastric mucosa is a common congenital anomaly unrelated to Barrett’s esophagus. 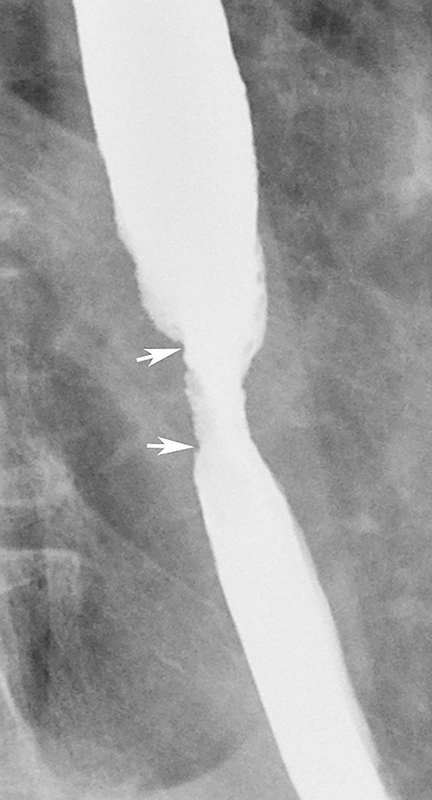 It typically is discovered as an incidental finding on the right lateral or, less commonly, the left lateral wall of the upper esophagus at or near the thoracic inlet and is manifested on barium studies by a broad, flat depression, with shallow indentations at its superior and inferior margins (Figure 10).30 While this finding could be mistaken for a flat ulcer, its characteristic appearance and location should suggest the correct diagnosis. The vast majority of patients with ectopic gastric mucosa in the esophagus are asymptomatic. Malignant tumors in the upper or midesophagus are usually squamous cell carcinomas. 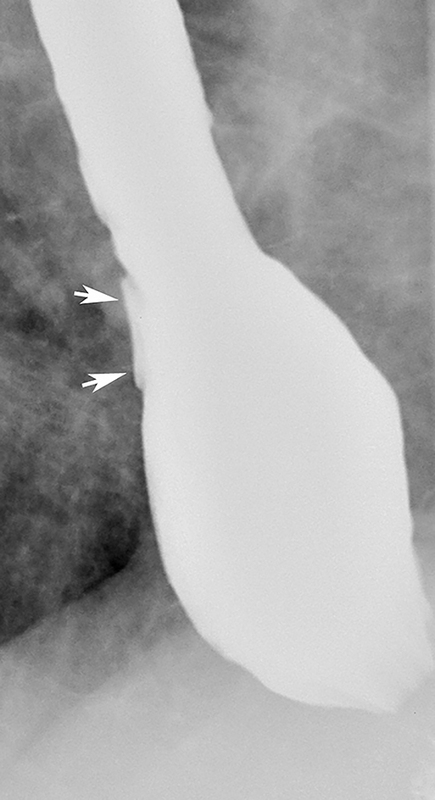 While benign strictures typically have a smooth contour and tapered margins (Figures 11 and 12), malignant strictures have a more irregular contour and abrupt, shelflike margins, often associated with mucosal nodularity and ulceration (Figure 13).1,31 The history is also important, as patients with benign strictures have more long-standing dysphagia and little or no weight loss, whereas patients with malignant strictures have recent onset of progressive dysphagia and substantial weight loss. Thus, infiltrating carcinomas can usually be differentiated from benign strictures on the basis of the clinical and radiographic findings. Most benign strictures in the distal esophagus are caused by scarring from reflux esophagitis.28,31 These reflux-induced or so-called peptic strictures most commonly appear as discrete (1-4 cm in length) segments of smooth, tapered narrowing, almost always above a hiatal hernia (Figure 9B). 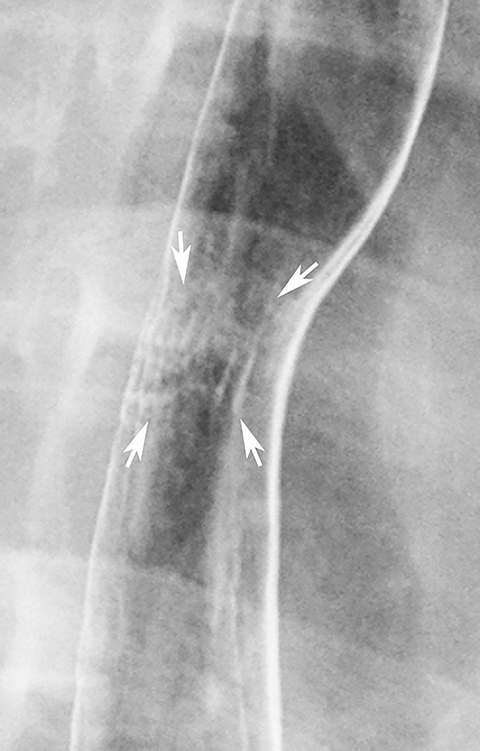 Not infrequently, however, peptic strictures are short (less than 1 cm in length), ring-like constrictions at or near the gastroesophageal junction . Such strictures can be mistaken for Schatzki rings (Figure 14),28,31 though they tend to be more asymmetric and have a slightly greater height than true rings. 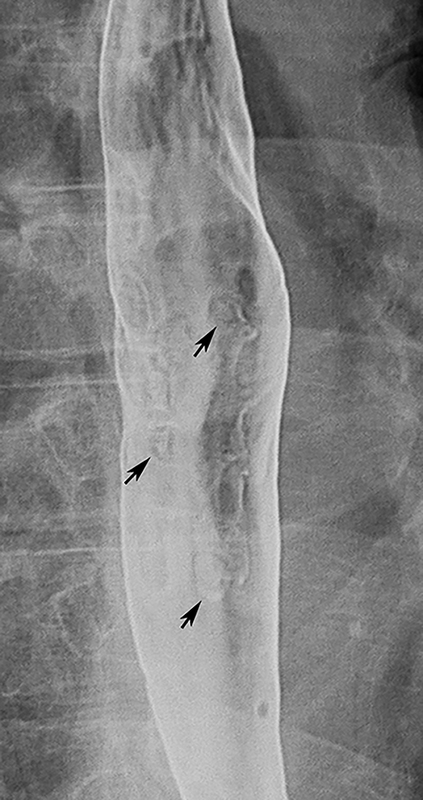 Conversely, nasogastric intubation, Zollinger-Ellison syndrome, and alkaline reflux esophagitis may result in rapidly progressive reflux-type strictures involving a much longer segment of the distal esophagus than most peptic strictures.28 Peptic strictures that have an unequivocally benign radiographic appearance are virtually always found to be benign, but strictures that are nodular, irregular, or asymmetric should be evaluated by endoscopy and biopsy to rule out malignant tumor. Esophageal adenocarcinomas arise in areas of preexisting columnar metaplasia within Barrett’s esophagus and therefore tend to be located in the distal esophagus. 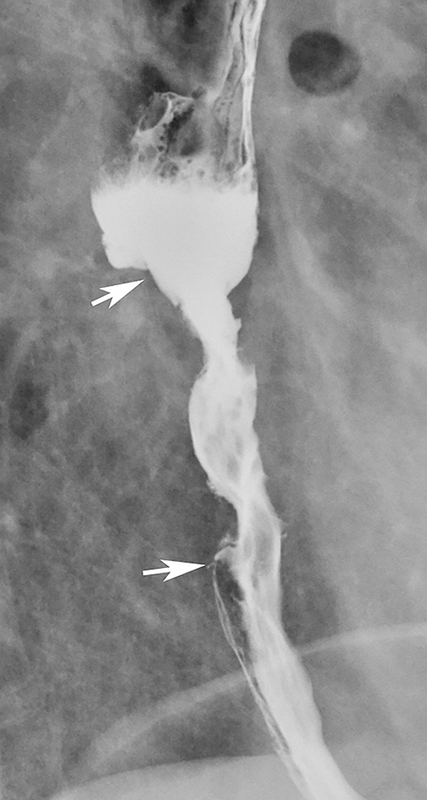 Advanced adenocarcinomas are usually infiltrating lesions that narrow the lumen and, unlike squamous cell carcinomas, have a marked tendency to invade the gastric cardia and fundus.1 These lesions typically appear on barium studies as irregular areas of luminal narrowing with shelflike margins (Figure 15). Occasionally, however, an early adenocarcinoma may be recognized by nodularity or irregularity within a preexisting peptic stricture.1 Endoscopy and biopsy are required to rule out malignant tumor in these patients. Eosinophilic esophagitis is an inflammatory condition, usually occurring in children or young adults (especially men) with long-standing dysphagia and recurrent food impactions. Affected individuals often have an atopic history, asthma, and/or peripheral eosinophilia.32 Some patients have smooth, long-segment narrowing or diffuse loss of distensibility of the entire thoracic esophagus (without a discrete stricture), producing a so-called small-caliber esophagus (Figure 16A).33 Other patients have multiple distinctive ringlike indentations (sometimes associated with a focal stricture or diffuse esophageal narrowing), producing a so-called ringed esophagus (Figure 16B).34 In a young man with long-standing dysphagia and an atopic history, a small-caliber or ringed esophagus should be highly suggestive of eosinophilic esophagitis. Ingestion of a strong acid or base may cause severe esophagitis, leading to stricture formation within 1-3 months. 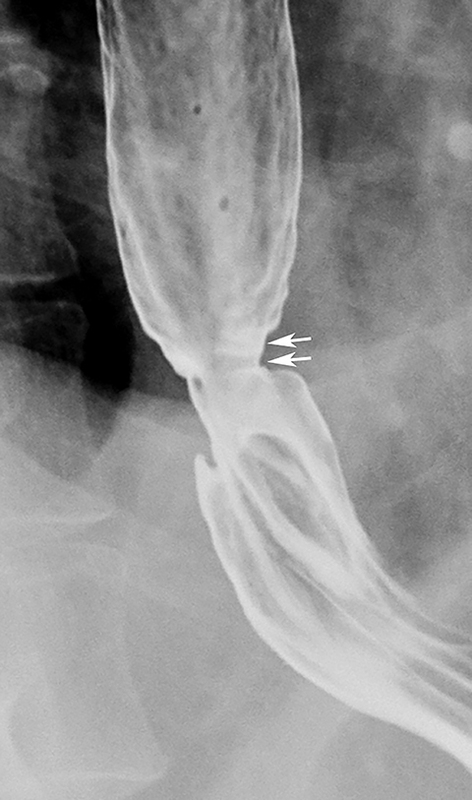 Lye strictures are manifested by segmental narrowing of the upper or midesophagus or, in advanced cases, by diffuse, marked narrowing of nearly the entire thoracic esophagus (Figure 17).28,31 The small-caliber esophagus of eosinophilic esophagitis may produce similar findings (see Figure 16A), but is not usually associated with as much narrowing and irregularity as a severe lye stricture. In problematic cases, the correct diagnosis can almost always be made from the clinical history. 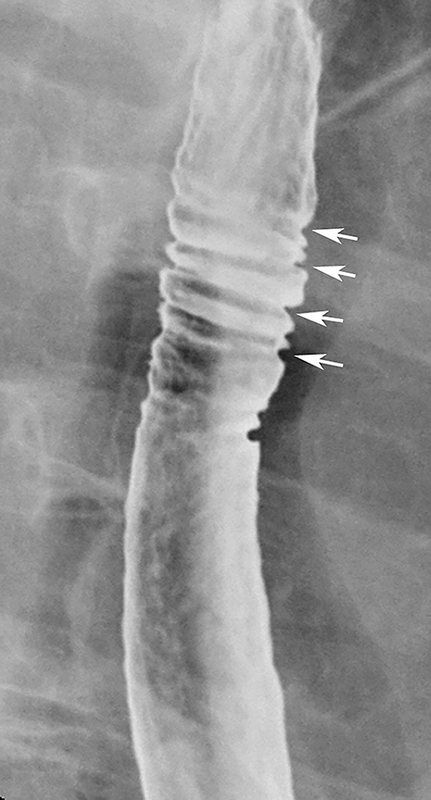 The feline esophagus is manifested on barium studies by closely spaced, thin, horizontal striations extending across the circumference of the esophagus (Figure 18).35 While the feline esophagus may be discovered as an incidental finding, it is nearly always associated with gastroesophageal reflux and is usually observed during actual reflux episodes.35 The characteristic appearance and transient nature of the feline esophagus enable differentiation from other types of esophageal rings. As discussed earlier, patients with eosinophilic esophagitis may develop distinctive ringlike indentations (sometimes associated with a focal stricture or diffuse esophageal narrowing), producing a ringed esophagus (see Figure 16).34 While the pathogenesis of the rings is unknown, this appearance should be highly suggestive of eosinophilic esophagitis, particularly in young men with long-standing dysphagia, recurrent food impactions, and a history of allergies or asthma. Levine MS, Rubesin SE. Diseases of the esophagus: Diagnosis with esophagography. Radiology. 2005;237:414-427. Graziani L, Bearzi I, Romagnoli A, et al. Significance of diffuse granularity and nodularity of the esophageal mucosa at double-contrast radiography. Gastrointest Radiol. 1985;10:1-6. Dibble C, Levine MS, Rubesin SE, et al. Detection of reflux esophagitis on double-contrast esophagrams and endoscopy using the histologic findings as the gold standard. Abdom Imaging. 2004;29:421-425. Levine MS, Macones AJ, Laufer I. Candida esophagitis: Accuracy of radiographic diagnosis. Radiology. 1985;154:581-587. Levine MS. Infectious esophagitis. Semin Roentgenol. 1994;29:341-350. Gefter WB, Laufer I, Edell S, Gohel VK. Candidiasis in the obstructed esophagus. Radiology. 1981;138:25-28. Glick SN, Teplick SK, Goldstein J, et al. Glycogenic acanthosis of the esophagus. AJR Am J Roentgenol. 1982;139:683-688. Lee, SS, Ha Hk, Byun JH, et al. Superficial esophageal cancer: Esophagographic findings correlated with histopathologic findings. Radiology. 2005;236:535-544. Itai Y, Kogure T, Okuyama Y, Akiyama H. Diffuse finely nodular lesions of the esophagus. AJR Am J Roentgenol. 1977;128:563-566. Levine MS, Laufer I, Kressel HM, Friedman HM. Herpes esophagitis. AJR Am J Roentgenol. 1981;136:863-866. Levine MS, Loevner LA, Saul SH, et al. Herpes esophagitis: Sensitivity of double-contrast esophagography. AJR Am J Roentgenol. 1988;151:57-62. Shortsleeve MJ, Levine MS. Herpes esophagitis in otherwise healthy patients: Clinical and radiographic findings. Radiology. 1992;182:859-861. 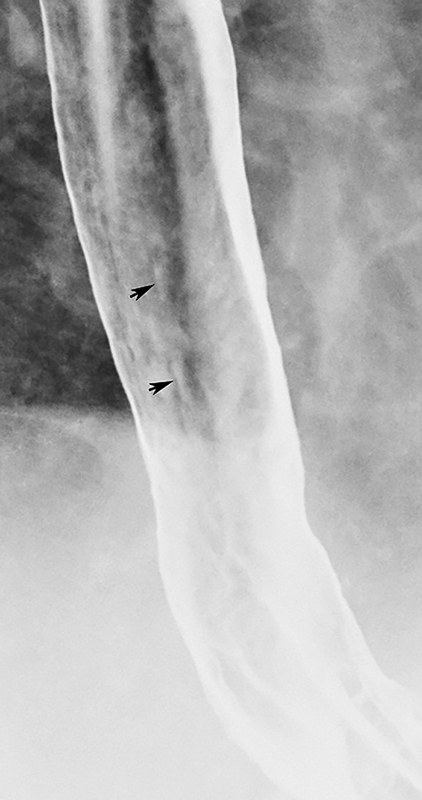 Levine MS, Rubesin SE, Laufer I. Barium esophagography: A study for all seasons. Clin Gastroenterol Hepatol. 2008;6:11-25. Gohel V, Long BW, Richter G. Aphthous ulcers in the esophagus with Crohn colitis. AJR Am J Roentgenol. 1981;137:872-873. Degryse HR, De Schepper AM. Aphthoid esophageal ulcers in Crohn’s disease of ileum and colon. Gastrointest Radiol. 1984;9:197-201. Akin S, Tufan F, Bahat G, et al. Cytomegalovirus esophagitis precipitated with immunosuppression in elderly giant cell arteritis patients. Aging Clin Exp Res. 2013;25:215-218. Moosig F, Gross WL. Esophagitis during immunosuppression. Z Rheumatol. 2012;71:326-327. Fiegl M, Gerbitz A, Gaeta A, et al. Recovery from CMV esophagitis after allogeneic bone marrow transplantation using non-myeloablative conditioning: The role of immunosuppression. J Clin Virol. 2005;34:219-223. Rabeneck L, Popovic M, Gartner S, et al. Acute HIV infection presenting with painful swallowing and esophageal ulcers. JAMA. 1990;263:2318-2322. 21. Sor S, Levine MS, Kowalski TE, et al. 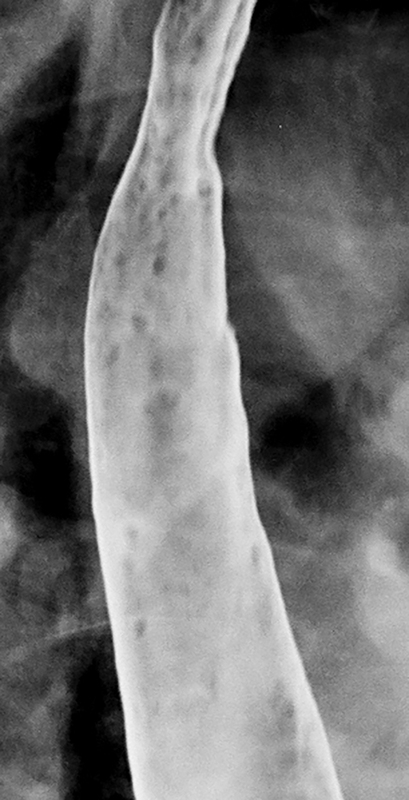 Giant ulcers of the esophagus in patients with human immunodeficiency virus: Clinical, radiographic, and pathologic findings. Radiology. 1995;194:447-451. Levine MS, Loercher G, Katzka DA, et al. Giant, human immunodeficiency virus-related ulcers in the esophagus. Radiology. 1991;180:323-326. Zografos GN, Georgiadou D, Thomas D, et al. Drug-induced esophagitis. Dis Esophagus. 2009;22:633-637. Levine MS, Rothstein RD, Laufer I. Giant esophageal ulcer due to Clinoril. AJR Am J Roentgenol. 1991;156:955-956. Ryan JM, Kelsey P, Ryan BM, Mueller PR. Alendronate-induced esophagitis: Case report of a recently recognized form of severe esophagitis with esophageal stricture--radiographic features. Radiology. 1998;206:389-391. Levine MS. Barrett esophagus: update for radiologists. Abdom Imaging. 2005;30:133-141. Cho SR, Sanders MM, Turner MA, et al. Esophageal intramural pseudodiverticulosis. Gastrointest Radiol. 1981;6:9-16. Takeji H, Ueno J, Nishitani H. Ectopic gastric mucosa in the upper esophagus: Prevalence and radiologic findings. AJR Am J Roentgenol. 1995;164:901-904. Vasilopoulos S, Murphy P, Auerbach A, et al. The small-caliber esophagus: An unappreciated cause of dysphagia for solids in patients with eosinophilic esophagitis. Gastrointest Endosc. 2002;55:99-106. White SB, Levine MS, Rubesin SE, et al. 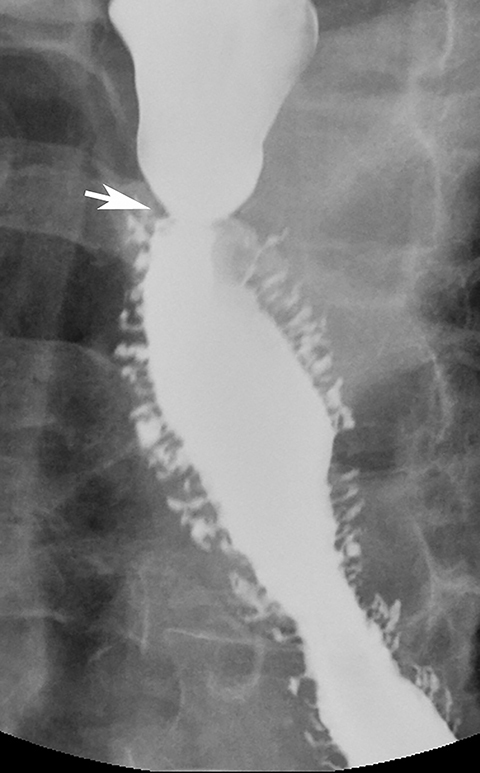 The small-caliber esophagus: Radiographic sign of idiopathic eosinophilic esophagitis. Radiology. 2010;256:127-134. Zimmerman SL, Levine MS, Rubesin SE, et al. Idiopathic eosinophilic esophagitis in adults: The ringed esophagus. Radiology. 2005;236: 159-165. Samadi F, Levine MS, Rubesin SE, et al. Feline esophagus and gastroesophageal reflux. AJR Am J Roentgenol. 2010;194:972-976. 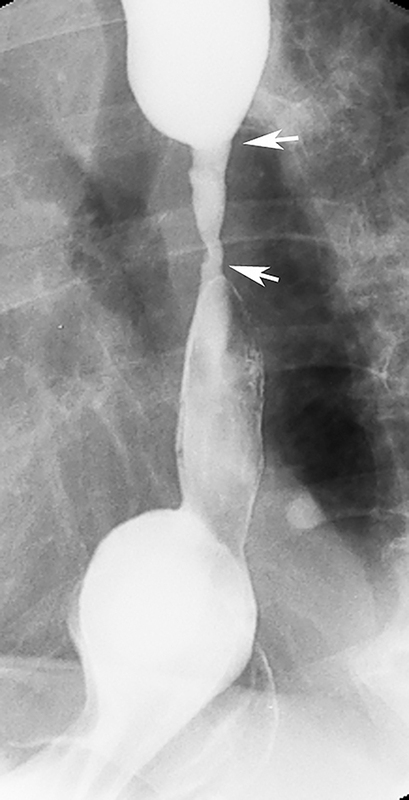 A clinical/pattern approach for barium esophagography. Appl Radiol.